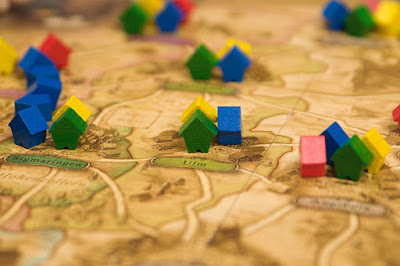 As promised last week, this post is all about German-style board games. I'll skip detailing their characteristics; the details and examples in the aforementioned Wikipedia link are solid. These games are sometimes called Eurogames, but I think that moniker does mild discredit to the handful of American companies like Rio Grande Games, Fantasy Flight and Avalon Hill that do produce excellent, substantive games. By and large though, the best games are European. While obviously much smaller, the audience community for these games is much closer to what many would like the digital games community to be like. Audiences are quite aware of the games' designers and the release of a new game by a recognized designer is an anticipated event. In fact, in German these games are called Autorenspiel, literally "author games." The best new games are recognized with several prominent yearly awards, none of which are fueled by Mountain Dew. There's a lot digital game designers can learn from board games, but translation often isn't direct. Many board game mechanics thrive on face to face interaction, which is becoming increasingly rare in an era of networked gaming. And by their nature, board games are turn-based multiplayer affairs, another rare combination. Still, there is plenty to learn if you're willing to take the plunge. Ahead are five of my favourite board games and compelling mechanics from each I'd like to see more of in digital games. 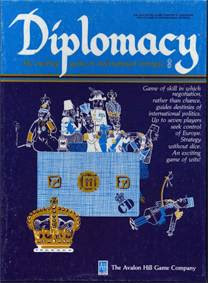 One of the oldest games of its kind, Diplomacy was created in 1954. Players control one of seven pre-WWI imperial powers and seek to gain dominance over Europe. Diplomacy is interesting because it's entirely a strategic game, no dice to be rolled, no cards to be drawn. In Risk-esque fashion, player direct military forces. However, the actions for their units are submitted in secret and are only resolved once all players have turned in their orders. This means each turn consists of fierce negotiation, conspiracy and politicking. The game can be won by a single player or an allied pair, but no more. While some digital games like Civilization and Alpha Centauri have had some similar mechanics, they're often far more random and the other players' forces are largely hidden. In Diplomacy the board is laid entirely bare, and the real game takes place in the interactions between players. A serious game of Diplomacy is a rare experience and one I highly recommend (with scotch ideally, it just seems so appropriate). In contrast to Diplomacy, Ticket to Ride involves a great deal of randomness and only indirect competition between players. The game take place on a railway map and each player's objective is to create train lines between certain locations. Different lines require a specific number of coloured train cards, drawn semi-randomly. The routes are also cards drawn randomly and remain hidden from other players. The risk/reward decisions are very good, as each route card is worth a specified amount of points that increases with length, but that amount of points is lost if the route is not complete by the end of the game. As your primary objective is to complete routes, it's rarely beneficial to aggressively attempt to block other players' possible routes. Occasionally it's advantageous to cut off a route another player is looking to complete, but doing so often jeopardizes your own ability to complete routes. Few digital games allow for success through indirect competition; at best it's an alternative to direct competition and aggression. I'd be very curious to see a digital game whose dynamics make indirect competition the only real option. Of all the games mentioned here, this is one of the easiest to get into. It's quick to play and simple enough to have broad appeal. I recommend it highly, with the caveat that one should not get the North American map version of the game. It was the first released and after being played a few times, it's clear there are some more dominant strategies. The European and Nordic countries versions that came after are substantially improved. 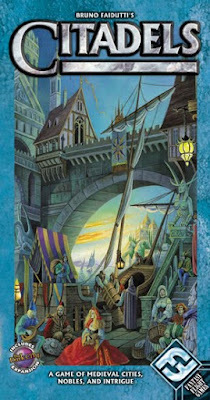 Citadels involves building a vaguely medieval city from a deck of district cards. Each turn, players choose one noble from a semi-random deck as their character for that turn. Nobles have different abilities (detailed here) that affect players' actions. There's a whole lot of getting into other players' heads, guessing at which noble they may have selected given their current money, districts, etc. Getting too far ahead too early is dangerous, as all the other players can easily gang up on a single clear leader. The game also supports up to nine players, but the most I've played it with is five. A nine player game would be madly, but wonderfully, chaotic. The game only uses cards and a few small tokens for money, so it's probably the most portable game I mention here. Taluva plays somewhat like a combination of Settlers of Catan and Carcassonne, but with several fantastic twists. The game consists of creating and settling a primitive tropical island. Each turn a player draws and lays a new geographic tile (a triangle of hexes, if that makes sense) with some conditions. The goal is build a certain number of settlements, but laying new geography can destroy existing settlements. Additionally, tiles can be played on top of other tiles (again, with certain conditions), allowing the game to expand in two dimensions. What's fascinating about this is as the game is played, the island begins to look remarkably like a proper island. Ridges, plains and valleys all emerge naturally through gameplay, as do the locations of villages and temples. At first the game seems simple, but about halfway through the first game, the full scope of its complexity starts to be revealed. Of all the games mentioned here, Betrayal at House on the Hill has my favourite mechanic. The game consists of the players exploring a "procedurally generated" abandoned house made up of randomly drawn tiles (not unlike how Torchlight generates its dungeon). While that alone would be interesting, the twist is that at a certain point in the game, one of the players is randomly revealed as the betrayer. At this point, they become substantially more powerful and it's them vs. the rest of the players. That former ally transforming into a villain is such a great dynamic that I cannot fathom why this hasn't been done (well) in a digital game. The closest thing would be the bank heist multiplayer in Kane & Lynch that consists of a bank heist. The heist is split amongst all the robbers that survive, but off your comrades too soon, and you may not be able to complete the heist at all. 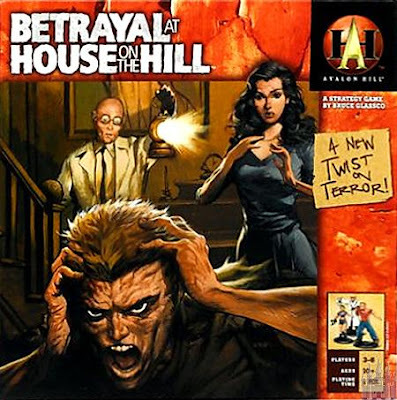 Interesting, but nowhere as compelling as Betrayal at House on the Hill. While I haven't played it, I've heard the new Battlestar Galactica board game has a similar mechanic. Currently, Betrayal at House on the Hill is out of print, but in looking for information about this post, I discovered that a second edition is forthcoming! I highly recommend giving it a look when it arrives later this year. And this is just the tip of the iceberg. There is a mountain of German-style board games of all stripes. Arkham Horror marries cooperative play with steep, steep odds fighting horrors from the stars. Settlers of Catan's legendary trading gameplay creates a great cooperative/competitive dynamic. I just picked up Pandemic as a gift for friends and am really looking forward to seeing how it unfolds. As creators of digital games, we ought not to lose sight of developments in the non-digital gaming world. There's a lot we can learn from there, as they can from us. Pass on Monopoly, head down to your friendly local game store (Drexoll is Vancouver's) and find something worth analyzing. You never know what lessons may dwell inside the box of a humble-looking Autorenspiel. You didn't mention Dominion, which is fine, because you mentioned Citadels which I absolutely love. I don't see it get mentioned much, but it's such a great game of bluffing, double-bluffing, second guessing, and indirect direct competition (e.g. "I assassinate the merchant", not "I assassinate Gravey"). Discovering Drexoll a couple years ago was a huge revelation for me (and subsequent huge expense, but all worth it). I haven't been to their Friday gaming nights before but I've wanted to, just haven't manned up and done it yet. I'm so glad you mentioned these games. When Carc and Catan had been released on XBLA, I had my hopes up that this would become a trend in Euro games getting translated to downloadable titles, but it never really caught on. Such a shame considering some of the games that would have really done well, I believe. I'm thinking Puerto Rico, or even deck-building games like Dominion. Ah well, maybe someday. In any case, I really do enjoy the culture of boardgamegeek, and the fact that this style of game is still very strongly informed by the auteur model. Excellent recommendations, particularly Ticket to Ride as an entry point. The USA map is actually OK for beginners, depending upon how much time people actually have to find the stronger strategies. @Gravey I actually haven't played Dominion, but I've heard it's fantastic. I definitely need to check it out, maybe once Pandemic has been explored. And yes, the best thing about Citadels is how deep the rabbit hole goes. Few games keep me challenged to think through contingency upon contingency. @Paul Yeah it's unfortunate more of those didn't take off. But I think that without face-to-face interaction, a lot of those games can suffer (although not having to hand-score Carcassonne is a blessing). Still, there's definitely some room for digitizations of tabletop games that work a bit better. Diplomacy! There are so few people I have known willing to sit down and play a game, but it is still one of my all time favorite board games that no one has played. It is also one of the most heated games, riling up genuine mistrust and potentially anger. That a heavy mix to bring to video game. Pandemic is my current board-game of choice, with Battlestar a quick second. I'll be adding some of these to these shortly I'm sure. 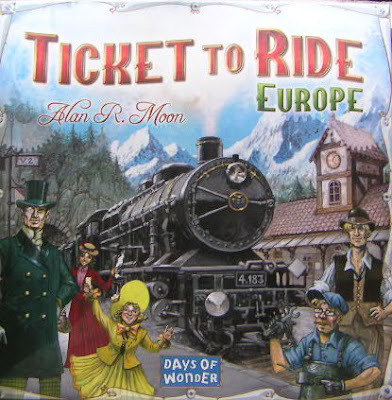 I sing in praise of Ticket to Ride! It was a big hit at my house over the holidays, especially since it's one of the few games players of all ages can play and genuinely enjoy. Candyland is a nice game for kids too...but I'd rather shoot myself in the head than ever play it again. Ticket to Ride is genius in this regard. Thanks for the helpful round-up, Nels. 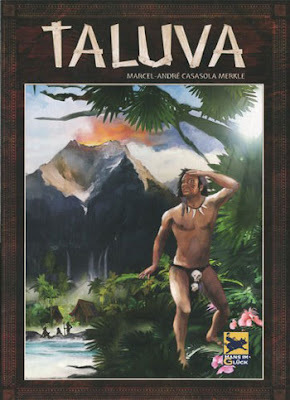 Piqued my curiosity about Teluva, which I've never played. I love seeing the crossover between tabletop gamers and digital gamers. I think there's a lot video games can learn from board games, and vice versa. One of my favorite XBLA games of last year was Panzer General: Allied Assault, which was designed concurrently as a board game and a video game. On the whole I agree with your assessment of the games (Citadels is an especially excellent game, and Betrayal is nearly as fun as it is broken), but I have some issues with some of your classifications here. Fantasy Flight is generally agreed to be one of the quintessential producers of American-style board games, and Avalon Hill isn't too far off. Betrayal is classic Ameritrash: lots of randomness, an emphasis on novel mechanics and theme over elegant design, player elimination, an abundance of fiddly bits, a comfortable acceptance of complexity etc. Arkham Horror just might be my favorite board game, but it's American to the bone. The Euro/American split in game design philosophy is more along those lines than actual lines of nationality. There are European designers that make American-style games (Bruno Faidutti also made Red November, which lies basically at the opposite end of the spectrum from Citadels), and American designers that make European-style games (Pandemic was designed by an American named Matt Leacock). Anyway, sorry to harp on so small a point in an otherwise excellent post. It's just that this is written as an introduction to modern board gaming, and it would be really easy to mislead a newbie here. If somebody falls in love with Arkham Horror, Betrayal at the House on the Hill or Battlestar Galactica, and then starts looking for Eurogames or German-style games they could be in for a lot of confusion. This is an interesting conversation to have, because I've actually played "digital" Diplomacy. You can play a game with strangers using your email if you've registered online (http://www.diplom.org/index.py). Gameplay... changes somewhat though. What would be a game that lasts several hours with friends becomes a game that instead spans months. This isn't the only difference, of course. The method of communication is different. Since one writes one's communications to his or her enemies and allies, and since one uses mail to correspondent (email, I grant you - faster than snail mail - but still) one has more time to carefully formulate responses and to consider strategies. A blessing and a curse at the same time. Added to that, it is infinitely more difficult to discern the tone of communications. Part of Diplomacy (a great part) comes in the form of trying to decipher body language and the like to determine whether your adversary is lying to you. It isn't so easy on paper. Sure, turns out there are some people who're bad at lying even via email, but the dynamic is notably different. I realize this isn't "game design" per your topic exactly, but I think it fascinating how much the dynamic can change when we make even a half-shift in medium. I tried playing Settlers of Catan over XBLA and found it extraordinarily difficult to play. The whole trading function (an important one, I've no doubt you'll agree) suffered too much. Carcassonne, which didn't really NEED talk, works wonderfully. Again, no big point to make here. Just observations. @Jorge If you, I and five other people end up in the same place with 4-5 hours to kill, we're totally busting out Diplomacy. @Michael Without a doubt! My wife is only so-so on board games (and her interest goes down as a game's rule complexity goes up), but Ticket to Ride never fails to appeal. Definitely give Taluva a look, it's got a lot going on once you start to look deeper. @Julian Yeah, absolutely. I was painting with a very broad brush. The NA vs. European thing is definitely just a general trend and there are definitely folks from both sides that cross the divide (or even, as you said, do both). Thanks for noting that and your other comments. @S It's definitely true that the dynamic of most tabletop games changes without face-to-face interaction. Very interesting thinking about your comments of not being able to deceive strangers. I wonder how broad that trend is? It's something I've never really thought about much personally and haven't had the need to test. Some always say "It's just a game," but the other players are still people. That's definitely an interesting tension, thanks. For another games with a betrayal mechanic, you may wish to check out Shadows over Camelot. I haven't played it myself, but the synopsis I've heard from my friends is that there's a team of players trying to beat the game rather than competing with each other. However, a certain percentage of the time, one of the players is a traitor. Apparently the game is nigh impossible to beat when there is a traitor. I wonder if the point is in part to keep the players on their toes when there isn't one. As I said, I haven't played it, but the friends that have like it. @Greg Oh, very interesting. I've heard good things about Shadows Over Camelot and have been meaning to check it out. Thanks! Did a Card Game Start the Spanish American War?